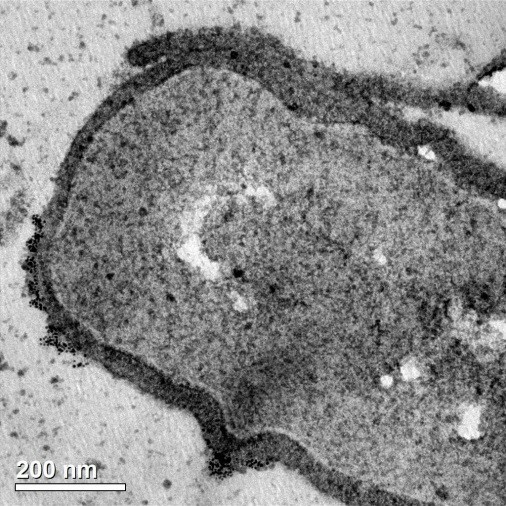 As we study the interactions of nanoparticles with cells, we often use a technique called transmission electron microscopy (TEM). This is very similar to light microscopy, but instead of shining visible light onto the thing we’re looking at, we send a beam of electrons through the sample to image very small structures. Electron microscopy is great for allowing us to see detailed interactions, but as someone who has spent hours in front of the scope looking for particles, I can tell you that it does get tedious. The problem is the size difference between nanoparticles and cells. A typical mammalian cell can be 2500 times the size of the nanoparticles we want to see, so if I’m searching through a sample where nanoparticles are scarce, I may have to look for a long time before I find anything. Transmission electron microscopy image of Bacillus subtilis with gold nanoparticles. Which one of those small black dots is a nanoparticle? Luckily, Nathan, my undergraduate mentee, came up with an idea to make imaging easier. He had just been trained on how to use the TEM, and during the training he learned about an optional mode called “dark field” microscopy. When we take a typical image, we discard certain electrons which are scattered too much, in order to make the image easier to focus. In dark field mode, we actually do the opposite: we use those highly scattered electrons to make the image, and discard the rest. This yields an image that is both darker and clearer than a normal TEM image. Some of the significant electron scattering that is discarded in regular TEM and used for imaging in dark field TEM happens when the electrons hit a nanoparticle with high mass or a particular crystal structure. When Nathan learned about this, he wondered if we could use dark field imaging to get a huge amount of contrast for highly crystalline nanoparticles like those we study at the CSN. It turns out, he was right! The image below is that same bacterium from the previous image, but viewed in dark field mode. The nanoparticles light up due to their high scattering, and all the other visual noise fades away. The same bacterium as in the previous figure, viewed in dark field mode. Check out the bright pinpoints of light on the far left side of the membrane: nanoparticles! This technique allows us to see nanoparticles clearly, even when we are at low magnifications. That cuts down on my time in front of the scope and allows us to look at even more samples. It also helps us to make more definite conclusions about whether the particles are inside or outside the cell, how they cluster together, and other important characteristics. We’re hoping that this publication will help other researchers in the same way. Well done, Nathan! 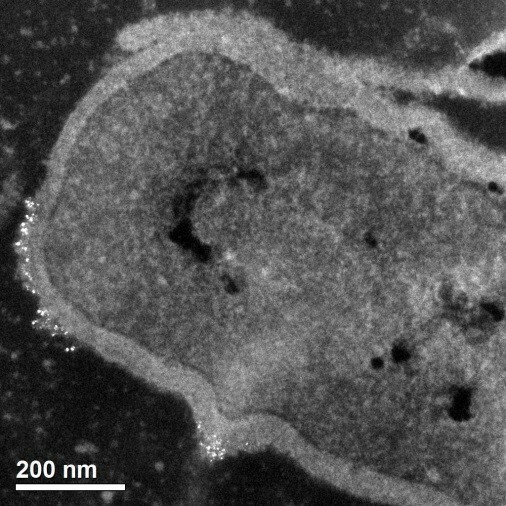 The TEM (left) and dark field (right) images of the same bacterium make for a useful side-by-side comparison.